You're all set! Confirm you want deals for Fallbrook Family Dentistry in -zip-? For top-quality dental care that makes patient satisfaction a top priority, in-the-know locals of Lincoln, NE, trust Fallbrook Family Dentistry. The professionals at this dental office treat every patient who walks through their doors as they would a member of their own family. Their commitment to providing compassionate dental services means taking the time to deliver personalized care, making patients feel like valued human beings and keeping them smiling and satisfied after every visit to the dentist. Fallbrook Family Dentistry offers an array of general and cosmetic dentistry services, including routine dental cleanings, dental surgery, denture fittings, customized veneers, and more. Whether your teenager needs braces or you are interested in a cosmetic dentistry procedure like teeth whitening, this dental office will expertly meet your needs. The dental professionals at Fallbrook Family Dentistry are dedicated to building life-long relationships with their patients. Their passion for helping you attain a beautiful and healthy smile will shine through in every element of their work, from the friendly greeting you’ll receive when you walk through the dental office’s door to the gentle care you’ll get in the dentist’s chair. The dental professionals at Fallbrook Family Dentistry are unwavering in their commitment to making every patient’s smile shine. 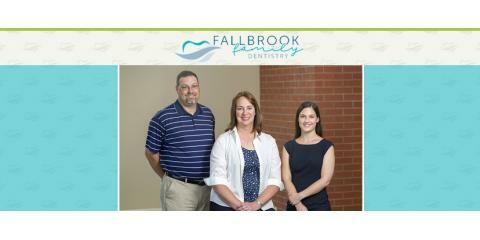 Ready to join the ranks of happy patients who put their trust in Fallbrook Family Dentistry? Call their Lincoln, NE, office at (402) 467-0007 to schedule an appointment today, and visit their website for more information on how to optimize your smile.